People encounter weight measurements on a daily basis. That includes when you wake up in the morning and stand on a scale to check on your diet’s progress, measure ingredients for cooking food, buying goods in grocery stores, and a lot more. In addition, there are several ways to measure weight since there are different types of weighing scales. However, the balance scale is one that most people refrain from using since they have no idea how to read a weight scale balance. 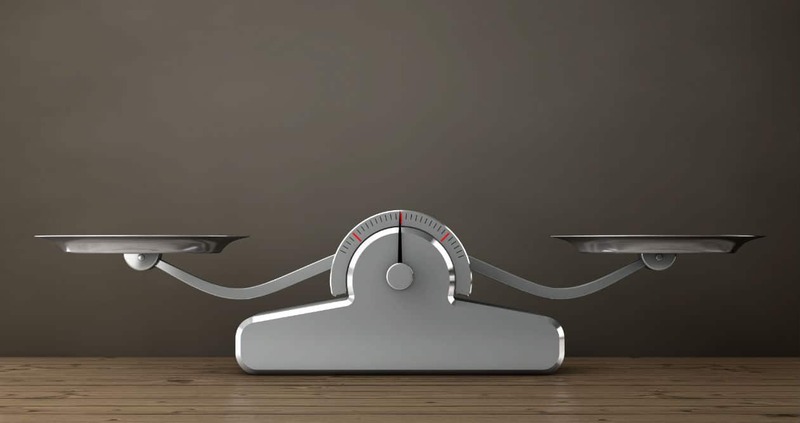 As the name implies, a balance scale is an instrument used to weigh an object by comparing its weight to another object with a known weight. This scale is the oldest type which measures the weight of an object with the help of a pivot and a lever. The object with the unknown weight is placed on one end of the lever while a pre-measured object is placed on the other end. If the lever is balanced, it means both objects have the same weight. If not, objects with known weights are placed alternately on one end until both ends are balanced. For this scale, you hang a pan on one end of a metal arm while on the other end, you move the sliding weight horizontally until you find a balance point and the arm is horizontal. This is very common in cooks and traditional wet markets. You just place an item you want to weigh on top of a platform. The platform then pushes downwards; stretching or compressing the spring inside. At the same time, a pointer turns around a dial with lines and numbers pertaining to specific weight measurements. This device is a fast and convenient way to measure weight. These digital scales have pressure sensors inside that produce electric currents when it gets compressed. The harder you push or the heavier the weight of an object, the more current it produces. Inside, an electronic circuit measures the current and converts it to weight. The first thing to do is zero the scale. If you see the large sliding weight and the small weight both on zero, the rotating beam should look horizontal and stop moving. Also, check that the needle on the right end is in the center. For accurate measurements, remove shoes, clothing and other items that can add weight. Facing the beam, step on the platform and stand still. Doing this should result in the left end of the metal beam to move downwards while the other end should move upwards until it hits the stopper. Looking closely at the beam, you will see two separate rows of bars with numbers and one sliding weight for each row. The bottom row has notches with increments of 50 pounds. It also has a larger sliding weight. While on the top row, a smaller sliding weight is used and the notches are marked with increments of two pounds. Gently move the larger counterweight to the right. You will feel notches pertaining to the weight increments where the weight can rest. Continue moving the weight and stop when the arrow at the right end of the balance beam falls downward. Moving it back one notch at a time will move the arrow upward. For the top bar, move the smaller weight along the bar towards the right until the arrow is level and the beam is parallel to the floor. On each bar, look for the numbers marked by each weight. For example, if the bottom is marked at the 100 increment and the top bar is at 34, then your weight is 134 pounds. A note to remember, though, is that the weight that you have read might not necessarily be the correct one. That is because particular things can affect your actual weight’s reading. Food intake. Carbohydrate is stored in the body in the form of glycogen. Carbohydrates promote retention of water in the body. This water weight is usually temporary and can be shed off through lots of training and lessening your carbohydrate intake. Food, in general, has its own mass, even after you’ve swallowed and digested it in your stomach. This added mass in your system can alter your scale weight. Water in the body. The amount of fluid in your body largely affects your scale weight. High-sodium intake can cause your body to retain more water due to the release of hormones that control the balance between sodium and water concentrations. Apart from knowing how to read a weight scale balance, you must also learn how to properly calibrate it for you to ensure that what you are reading is correct. Scales upon purchase are usually calibrated at the factory or store. However, environmental factors such as usage, moving the scales, and temperature fluctuations can cause your balance scale to go out of calibration. Aside from knowing how to use a weight scale balance properly, it is also important to take note that to ensure accurate weight measurements every time, proper and regular calibration are required. Below are the things you need to do. Empty the platform and slide all the weight to zero. Make sure that the pointer is on zero, if not, adjust the zero adjustment screw until you see the pointer indicate a zero. On the platform, place an object with a known weight. Adjust the weights until the beam is in a balanced position. Check if the known weight of the object and the weight indicated on the balance scale is the same. If your known weight is at 16 pounds and your scale reads 14 pounds, you need to calibrate down. Adjust the lever arm according to the new calibration change. Whether for personal or work purposes, knowing how to operate a weight scale balance properly is important. Not only will you be able to use it to accurately track your progress in achieving your desired weight, but having the basic knowledge to manually measure something using a scale balance can also come in handy in case no digital scales are available.